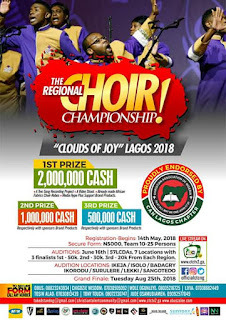 The Clouds of Joy Regional Choir Championship is a strategic move to recognize, encourage and reward team work, selfless service in the gospel music industry. With that in mind, the Christian Talents Community has come up with the Clouds of Joy Regional Choir Championship. In this event, Choirs made up of a minimum of 10 persons and maximum of 25 persons will have to show their credibility, team work and excellent spirit. At the end of the competition, the winner will be walking home with a whooping sum of TWO MILLION NAIRA (2,000,000:00), the second position and third positions are not left out as they will as well be getting ONE MILLION NAIRA (1,000,000:00) and FIVE HUNDRED THOUSAND NAIRA (500,000:0) respectively, not ending there a lot of consolation prices and plenty benefits awaits you. What then are you waiting for? Register today with the sum of FIVE THOUSAND NAIRA ONLY (5,000). For more information and registration details check the flier or call/whatsapp the following number 0802 324 3934.